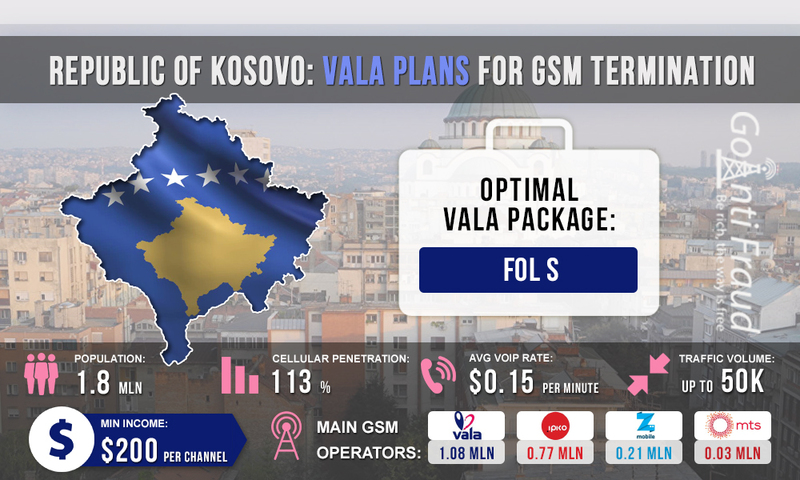 Kosovo Telecom provides cellular services under Vala brand in Kosovo. This is a state-owned operator that has long been operating in the local market. Vala accounts for the majority of mobile subscribers in the country (more than 50%). The operator's GSM coverage is available in most regions of Kosovo. With a competent approach to the choice of a tariff plan, an entrepreneur can earn $200 and more on voice termination (from each equipment port). Vala prepaid SIM cards are priced at $3.4. This also covers the loan you immediately get on your account - $1.1 and 700 MB of mobile Internet traffic. That means that in fact, the SIM card will cost the terminator only $ 2.4. Vala’s standard calling rates are as follows: $0.1 per minute within the operator’s network and $0.11 per minute for calls to other networks. FOL S. Provides 300 minutes for calls, 2000 MB and 300 SMS, the cost of connecting the package is $3.4. FOL M. Provides 600 minutes for calls, 3000 MB and 600 SMS, the cost of connecting the package is $5.6. FOL L. Provides 1400 minutes for calls, 4000 MB and 1400 SMS, the cost of connecting the package is $11.3. INT M. Provides 200 minutes for calls, 8 GB and 200 SMS, the cost of connecting the package is $5.6. INT L. Provides 600 minutes for calls, 20 GB and 600 SMS, the cost of connecting the package is $11.3. The best solution for profitable business in the field of VoIP termination will be the FOL S package. With this package, the price per minute of a call will be about $0.01. With the equipment and voip software pbx running for 300 minutes a day, the terminator can earn about $700 from a gateway channel (provided that the gateways operate for 5 hours a day).